This will come automatically within 3 weeks if you’ve held a photocard provisional licence. If you haven’t, or have changed your name between passing and starting to drive, you’ll need to get a new one by getting form D1 directly from the DVLA or from the Post Office. If you’ve already got a car you’ve used as a learner, then all you have to do is to change the basis of your cover with your provider, or new provider. If your car has a black box fitted, you can continue to enjoy the benefits it provides and continue to drive down your insurance costs by working on your driving behaviour. If you haven’t got a car, when you buy one be sure to get telematics-based insurance, such as iKube. This will enable you to reduce the unavoidably high insurance premiums levied at young drivers until you build experience, confidence and can demonstrate you can drive responsibly. If you’d prefer not to have telematics-based insurance, you’ll need to go on comparison sites to find the most suitable for you. But beware, the cheapest young driver insurance isn’t always the best. Make sure you thoroughly check what is and isn’t included in your policy as there’s often a reason why it’s cheap. Getting your own car is a major milestone in your life, but it comes with a lot of responsibility. They don’t tend to run if they’re not looked after and they’re not allowed on the road if they don’t have the correct documentation showing they are both roadworthy and road legal. Needs updating every 10 years and in between if you change address. Is a record of your car’s ownership recording both its registered keepers and its legal owner, if both are different. Only buy cars from those identified as the legal owner, check that the VIN or chassis number matches the one on the car, and check to ensure the V5C’s watermark is genuine. Without a valid V5C it is illegal to sell a car. Replacements are easy to obtain. More commonly known as “Road Tax” and also as “Vehicle Excise Duty”. Road Tax needs to be paid every year on every vehicle that is used or kept on the public roads, unless it has been declared “SORN” (a Statutory Off-Road Notification). The amount paid depends on your car’s engine size and its CO2 emissions and the date it was first registered. Owners of older, more powerful, high polluting vehicles can expect to find themselves paying heavily. This needs to be reviewed annually bearing in mind your changing needs and circumstances and any incidents or events that may change the perceived risk you represent to insurers. Unless your car is less than 3 years old your car will need to pass an annual MOT (Ministry of Transport) test. If your car is over three years old, it will require an annual MOT. They’re not expensive in themselves (about £50), but anything on the MOT test list that is found to be defective will require immediate attention before the car can be put in for a “re-test” and before it can legally go back on the road. The test will also alert you to “advisories” that, while not defective, will require attention in the not-too-distant future. Regular maintenance will improve your car’s chances of passing its MOT, prevent little problems turning into big problems, reduce risk of accidents and / or your dependency on the emergency breakdown services. Before you attend your test make sure your fluid levels are topped up: failing a test due to no windscreen fluid is frustrating and time-consuming. Also check your tyre pressures. Once your insurance, licence and wheels are sorted you can enjoy the freedom of the roads. For many it will be a breeze but for some people it can be as worrying as when learning to drive, particularly if there has been a gap between passing their test and getting back into a car. If this is the case, then consider taking a few refresher lessons or taking the Pass Plus test to restore some of that confidence. Confidence high or rebuilt, it’s all about being a safe and responsible driver. In England and Wales, the drink-driving alcohol limit is 80 mg per 100 ml of blood; in Scotland the limit is 50 mg per 100 ml of blood. However, because alcohol affects everyone differently, there’s no fool proof way of drinking and staying under the limit. The best policy, then, is not to drink alcohol at all. 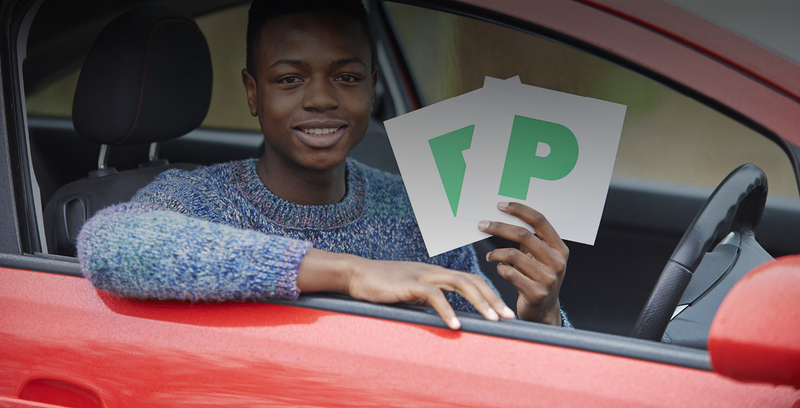 Many people feel they don’t like the attention that putting P-plates on their car as a newly qualified driver attracts. But that’s exactly what they’re meant to do: tell others that you’re a new driver, who’s perhaps prone to making the odd gaffe as you gain experience and confidence. In effect, they ask other motorists and pedestrians to exercise a bit of tolerance and forgiveness. If you’ve had telematics-based insurance, there will come a point at which your young driver premiums have reduced to more affordable levels and you may have grown a healthy no claims bonus. You are then at the enviable point you can present yourself as a proven safe, responsible and accident-free young driver to the wider insurance market. Keep your driving record clean, and you’ll enjoy many more years of relatively low cost driving.